I have found that it is the little things about Paris which have charmed me the most. 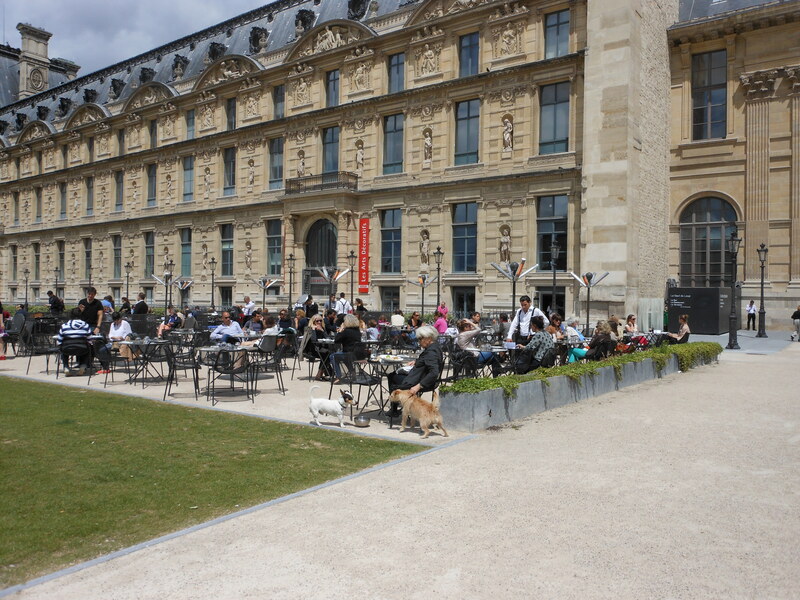 We arrived and walked right to the massively overwhelming Louvre, where we saw countless Parisians and their little dogs on the beautiful grounds. Even the dogs have a delightful joie de vivre, frolicking in the shadow of the world’s greatest art collection with reckless abandon. I tend to keep a short leash on both my pets and my children, so I watched with wonder while a little Jack Russell terrier ran freely across acres of hundreds of people and their dogs, owner nowhere in sight and yet no doubt well cared for. He wound up at a fancy outdoor cafe near the pyramids, where a formidable older woman was dining with her dog, complete with a silver bowl of water on the ground. The Jack Russell waltzed right up and helped himself to the other dog’s water, and I shot the picture below. I don’t know why it made me so happy, but it did. It also made me question why I am so uptight. I would never allow my dog to do that, and yet is was such a joyful thing to watch. Maybe these Parisians are on to something. We also witnessed a police chase. On rollerblades. We saw three African street vendors with their massive displays of Eiffel tower key chains jingling behind them, followed by three rollerblade-clad police officers chasing them into traffic where the vendors deftly jumped the concrete barriers the police could not pass with their rollerblades. Maybe you had to be there, but it was one of those funny, “Did we just see that?” moments. When your life is very predictable and orderly, the colorful characters of a city are a pleasant treat. My sense of direction is very poor, but I am at least able to follow a simple grid-like map for dummies in cities like New York and Philadelphia — the the kind of map you get in third grade when you learn basic map reading skills. While these cities have tall buildings, they also have a lot of unique landmarks among their gridlike plan, so I can usually bumble my way through. Paris, on the other hand, has street after street of beautiful but similar style limestone buildings, plus the occasional palatial museum, peppered with restaurants, cafes and brasseries. In addition, optical stores are everywhere — eyeglasses are a huge accessory in Paris, and I quickly learned using an optical shop as a landmark was a very bad idea. The glorious maze of quaint side streets caused me to walk in circles for 45 minutes all the while being a mere two minutes from my intended destination. Embarrassing and sad. On the plus side, it’s also a bit magical. If you’re going to get lost anywhere, I highly suggest getting lost in Paris. Nestled between the alleys, I would stumble upon the classy French version of a strip mall (picture below) and it reminded me a bit of The Lion, The Witch and the Wardrobe — a totally unexpected world. 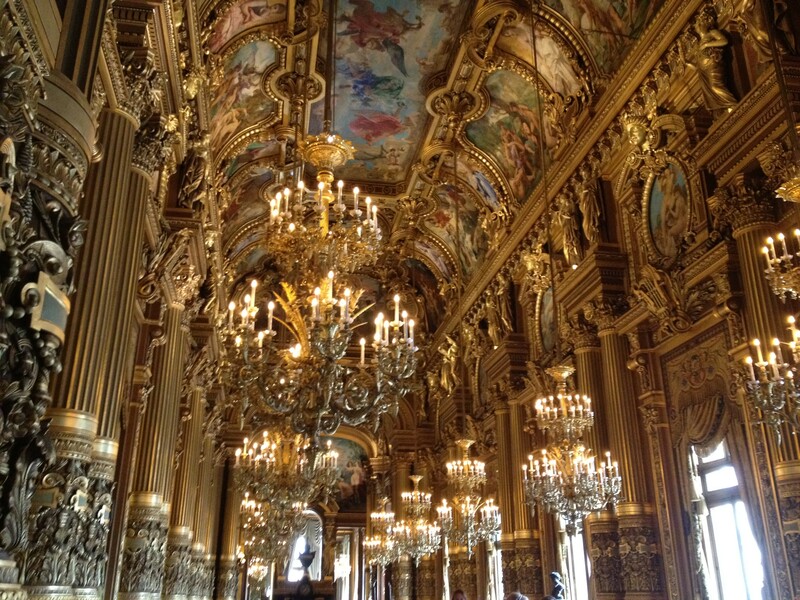 Based on yesterday’s “adventure,” I was hesitant to set out on my own for Palais Garnier, but I had no choice. I didn’t come to Paris to sit in a hotel room. I realized my modern life is filled with very few challenges. And even though finding a giant opera house less than half a mile from my hotel is not exactly Amazing Race material, I felt proud of myself. I met up with a group from the highly recommended Paris Walks, and I was able to enjoy the rich history of THE opera house which inspired Phantom of the Opera even more. One of the highlights of my trip (and probably my life) was attending a reception at the US Embassy and meeting Ambassador Charles Rivkin and his wife Susan Tolson. 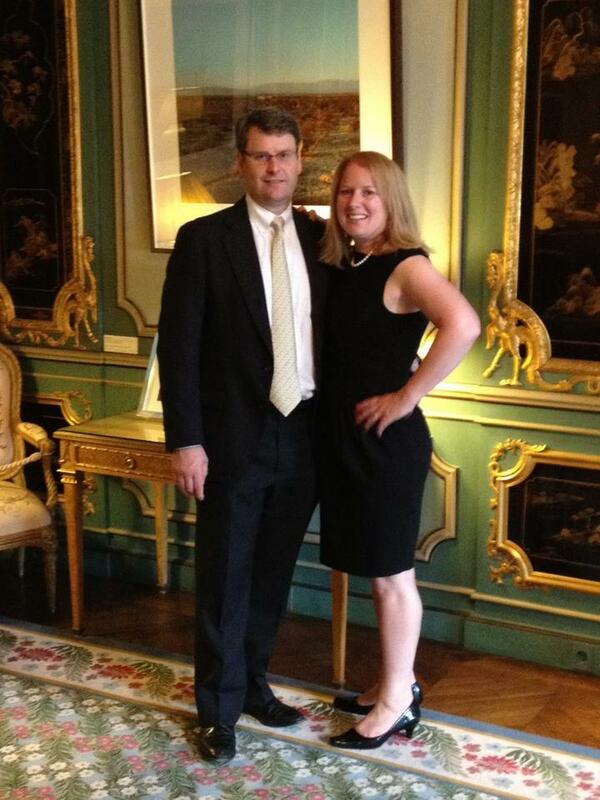 The embassy feels like a country estate right in the middle of busy Paris. 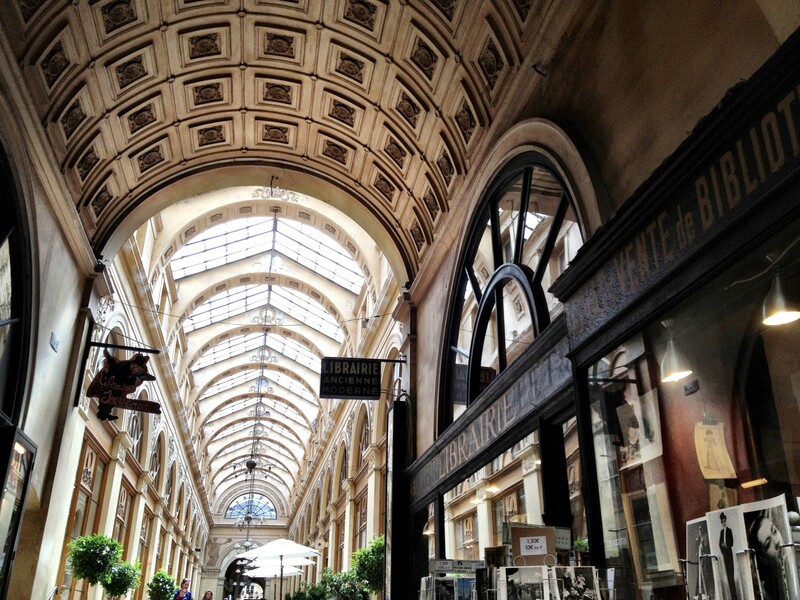 The interior was opulent (what isn’t opulent in France?) 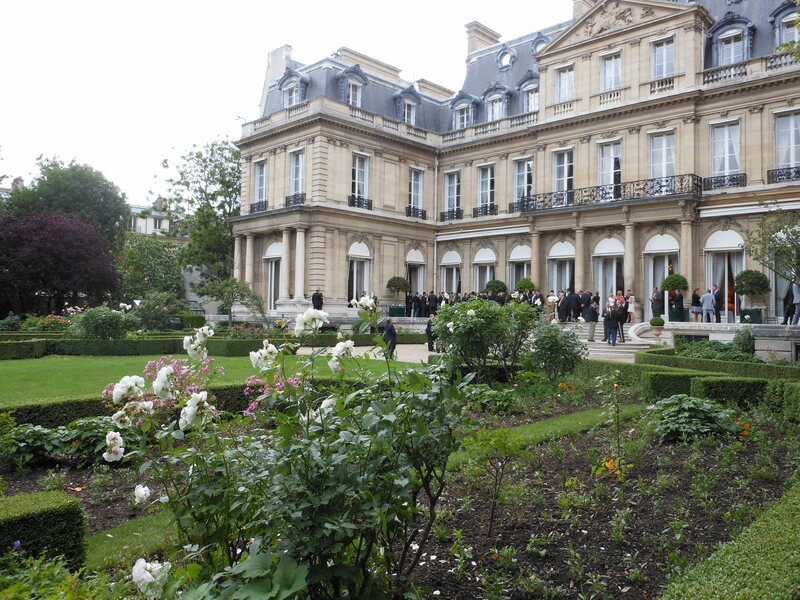 but the grounds and the gardens surprised me the most. The wine ranked up there with the best I ever drank, and the appetizers were innovative and — of course — beautiful and très petite. More on the food and wine in later posts, I promise. I don’t usually share too much about Ed’s work, as it’s his story to tell and not mine, but I will say that I am so proud of the work he and his colleagues do, and so humbled by the sacrifice made by our military. I was honored to be mingling with such a fine group of people and didn’t expect the evening to inspire feelings of patriotism. I was truly impressed with every person I met at the embassy and walked away feeling like our country is in very capable hands. I realize I don’t get out much, but one thing living in Chester County, Pennsylvania has taught me is the ability to tell the difference between genuinely impressive people and people who just try to impress you. I was in a room full of genuinely impressive people, and not one show-off in the bunch. Très refreshing! I have blathered on long enough for one post. If you are still reading this, merci! I will probably file two more trip reports (more for my own decrepit memory than for any other reason, but I will try hard not to bore you). 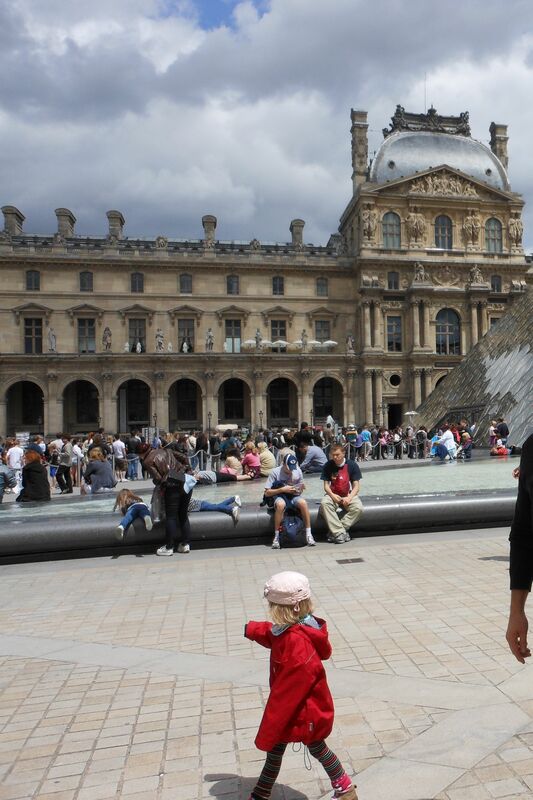 This entry was posted in Life and tagged France, Louvre, Opera Garnier, Palais Garnier, Paris, Paris Walks, travel by Mom Mom's Apron. Bookmark the permalink. Merci beaucoup! Swoon. More, more! Dawn, wonderful report. I am so glad you loved it. The two of you look so elegant and refined! Looking forward to reading more about the trip! Thanks, Iris! The only thing which would have made it better was if I could have met you there. Perhaps another year?